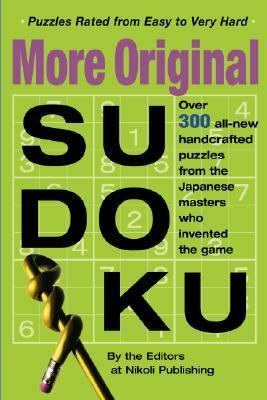 Over twenty years ago Nikoli, the Japanese puzzle and game company, started publishing a curious logic puzzle called Sudoku. The rest of the world recently joined the Sudoku craze by using computer programs to create puzzles, but Nikoli is the only company that still crafts their puzzles the old-fashioned way: by hand. As "Ad Age" wrote in a profile, the Nikoli credo is " The Best Puzzles Are Made by Happy Employees." And for solvers, it really does make a difference-- there's an elegance and symmetry to the puzzles, plus a sense of interaction. The puzzle-maker knows just when to encourage, and when to withhold. Puzzles marked " Easy, " are easy because the puzzler leads you through. Those marked " Very Hard" are exactly that-- they pit your mind against the mind of the master, who seems to share the joy of that moment when one hard-won number is captured, and the entire puzzle tumbles into place. An obsessive's collection, "More Original Sudoku" features over 300 puzzles, all in a chunky, easy-to-carry format (it even fits into a standard jeans-size back pocket). An introduction shows how to solve the puzzles at various levels of difficulty, and it includes a tutorial on how to create your own hand-made Sudoku. Here's wishing you "Gokouun o inorimasu!" (Good luck! )Nikoli Publishing Editors is the author of 'More Original Sudoku Book 3', published 2006 under ISBN 9780761143970 and ISBN 0761143971.